When parties enter into an agreement that includes a copyright license, and there is thereafter a failure to comply with one of the terms in the agreement, a court will have to decide whether it is a failure to meet a condition precedent to the license, in which case the accused use is not licensed and therefore a copyright infringement, or whether instead it is a failure to perform a contractual promise, a covenant, for which the remedy is only a breach of contract. At least that’s the way that I think it should be decided, but you will find different constructs for the distinction. See, e.g., MDY Indus., LLC v. Blizzard Entm’t, Inc., 629 F.3d 928 (9th Cir. 2010) opinion amended and superseded on denial of reh’g, 09-15932 (9th Cir. Feb. 17, 2011), Jacobsen v. Katzer, 535 F.3d 1373 (Fed. Cir. 2008) and Graham v. James, 144 F.3d 229 (2d Cir. 1998). So we have a quiz. The set up is that the plaintiff Joseph Sohm, ultimately through the licensing agency Corbis, granted licenses to defendant Scholastic Inc. to use his photographs in textbooks. It is undisputed that Scholastic printed more copies of the books than the invoices said it could. The question becomes whether the excess copying was a failure to meet a condition precedent for the licenses, and therefore were unlicensed uses subject to copyright damages, or whether instead the failure was only a breach of a covenant. 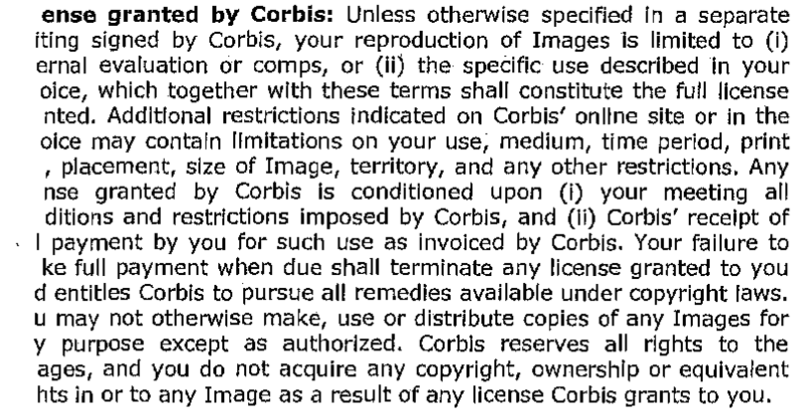 License granted by Corbis: Unless otherwise specific in a separate writing signed by Corbis, your reproduction of Images is limited to … the specific use descried in your invoice, which together with these terms shall constitute the full license granted…. 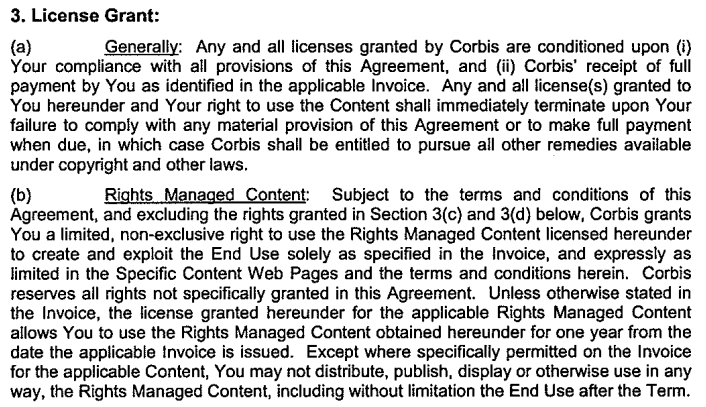 Any license granted by Corbis is conditioned upon (i) your meeting all conditions and restrictions imposed by Corbis, and (ii) Corbis’ receipt of [fu]ll payment by you for such use as invoiced by Corbis. Your failure to make full payment when due shall terminate any license granted to you and entitles Corbis to pursue all remedies available under copyright laws. You may not otherwise make, use or distribute copies of any Images for any purpose except as authorized. (b) Rights Managed Content: … Corbis grants You a limited, nonexclusive right to use the Rights Managed Content licensed hereunder to create and exploit the End Use solely as specified in the Invoice … . Except where specially permitted on the Invoice for the applicable Content, You may not distribute, publish, display or otherwise use in any way, the Rights Managed Content, including without limitation the End Use after the Term. What do you think? Are the excess copies a failure to meet the condition of the license, and therefore Scholastic is liable for copyright infringement, or was it only failure to meet a covenant and therefore Scholastic only liable for breach of contract? Add your thoughts to the comments section.